PENSACOLA, Fla. - The Jacksonville Jumbo Shrimp (4-5) defeated the Pensacola Blue Wahoos (6-3) by a 1-0 score in the fourth game of the five-game series at Blue Wahoos Stadium on Saturday night. Jacksonville right-handed relief pitcher Jordan Milbrath (1-0) earned the win with two scoreless innings of relief. Pensacola right-handed relief pitcher Adam Bray (0-1) took the loss, allowing the go-ahead run to score in the top of the eighth inning. Jacksonville left-handed relief pitcher Dylan Lee earned his first save by working the final two innings in scoreless fashion. 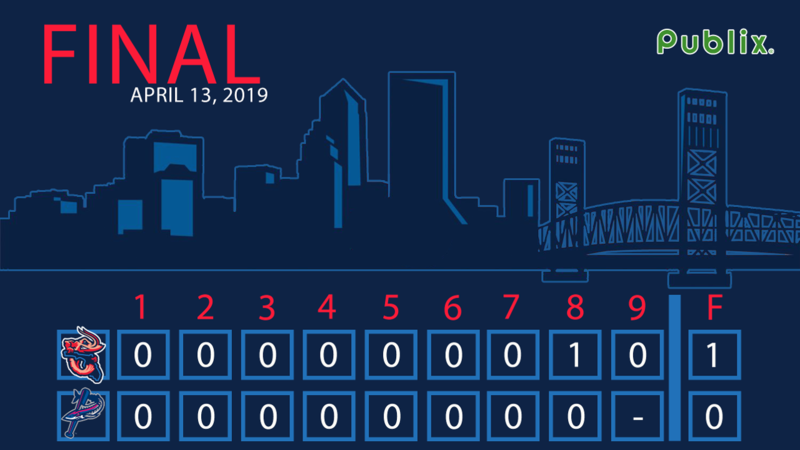 The game was scoreless until the top of the eighth, when with two outs Justin Twine delivered an RBI single that scored Magneuris Sierra from second base to give the Jumbo Shrimp a 1-0 lead, which would be the final score. The run ended a streak of 17 innings without a run for Jacksonville's offense, stretching back to Thursday night. Jacksonville right-handed starting pitcher Jordan Yamamoto had a no decision, working five scoreless innings where he allowed only one hit, walked two, and struck out four batters. Pensacola right-handed starter Griffin Jax also had a no decision, turning in six scoreless innings scattering three hits with two walks and four strikeouts. The Jumbo Shrimp and Blue Wahoos will conclude their series with the fifth and final game of the five-game set on Sunday afternoon at 2:05 p.m. eastern. Right-handed pitcher Cody Poteet (1-0, 0.00 ERA) will start for Jacksonville against Pensacola right-handed pitcher Andro Cutura (0-1, 1.80 ERA). Fans can listen to the game on the Jumbo Shrimp Network presented by Community First, beginning at 1:50 p.m. with the pregame show "Shrimp On Deck" locally on Sunny 102.3 FM, on the TuneIn Radio app, and www.jaxshrimp.com.